We awoke to find that the weather forecasters promise of a beautiful sunny clear day was true for once. Crisp, dry and with a dusting of snow on the tops, today promised to be a good day for both walking and photography. We were staying in our Caravan at Park Coppice therefore today was an opportunity to walk from the door without the worry of trying to find free parking or failing that, being exploited by the car park owners of Lakeland! Leaving Park Coppice the path took us along the edge of Bleathwaite Coppice and along to Fell Gate which is a popular area for starting a walk up Coniston Old Man - we could have branched off to the Walna Scar Road a couple of times but the path was good to Fell Gate therefore we kept along it. Reaching Fell Gate we turned left onto the Walna Scar Road and followed this over Cove Bridge to the path junction for Walna Scar and Brown Pike. Today was Remembrance Sunday and at 1100 we duly observed a 2 minute silence on the path - just a shame other people walking past us could not - no matter. The weather remained sunny with very little breeze and we made the short trip up to the top of Walna Scar which gave us a great view of White Pike and White Maiden but we resisted the temptation to carry on over to them and instead turned around and made our way up onto Brown Pike. 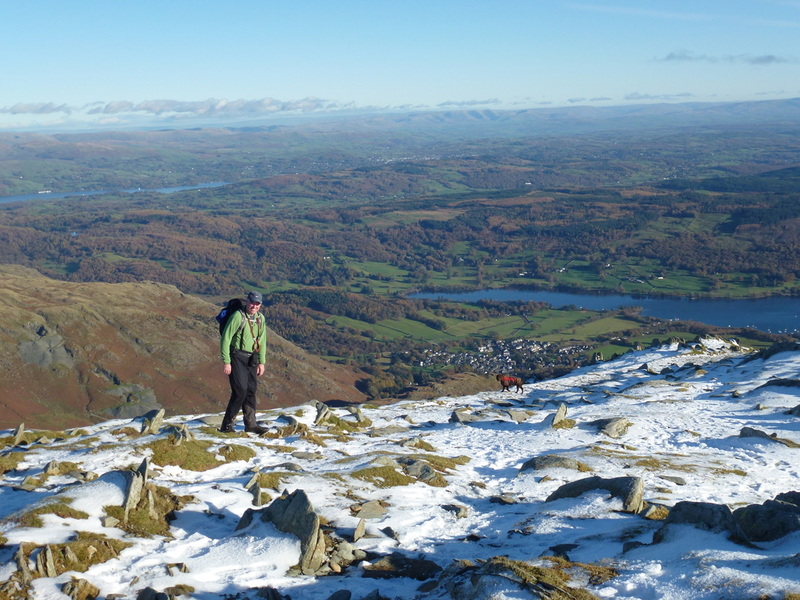 The walk over Brown Pike and Buck Pike to Dow Crag is a superb ridge walk which on a clear day affords you fantastic views of the Coniston Fells and over to the Scafells. Reaching Dow Crag, it started to get busy and we could already see the hoards of people on top of Coniston Old Man. 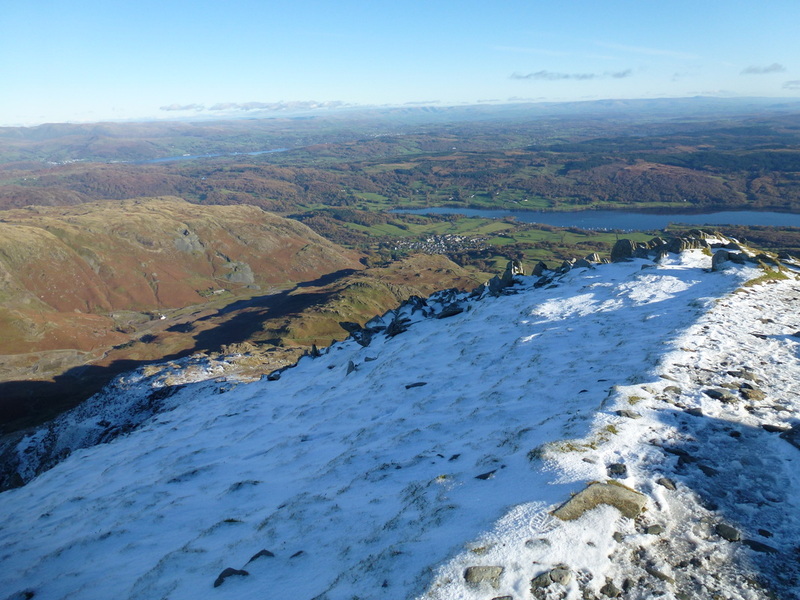 We then descended to Goat's Hawse before the steep ascent up to Brim Fell and then on to Coniston Old Man where it remained busy therefore we did not hang about. We descended via Crag O'Stile and Little Arrow Moor and the path became intermittent but the terrain was not overly onerous and led us down quite nicely to the Walna Scar Road. We then made our way back to Fell Gate and followed the path back to Park Coppice. This is another lovely walk and to do it on a day when the weather was on our side made it even better. Easy Gully on Dow Crag - no thanks, not today! 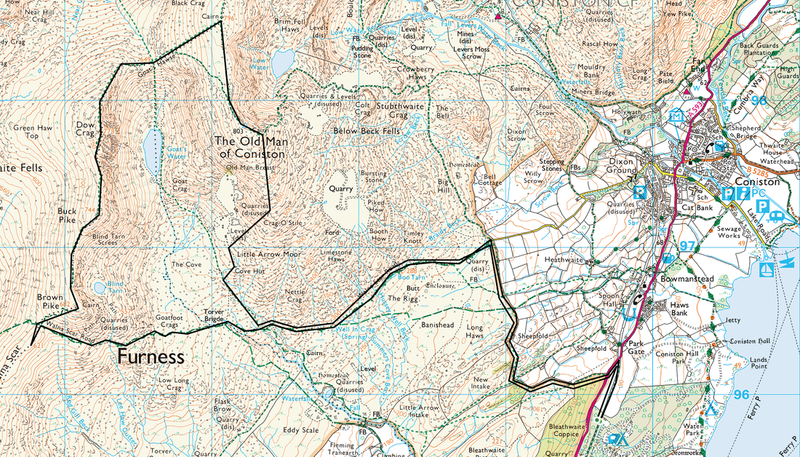 Coniston Old Man - not so busy but give it a minute!